Mother is the most important person in your life. If you want to express your love and gratitude to your mum on Mother’s Day, then express it with this special gift. 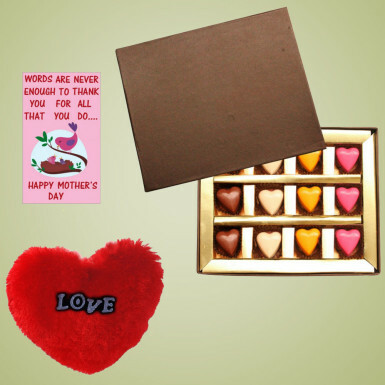 Convey love to your mom with this beautiful gift which includes a box of heart-shaped chocolates, a Happy Mother’s Day greeting card and a heart shaped cushion in red color. This is a perfect gift to your mom on Mother’s Day.